encountering the Yaks and Sherpas.magical setting of the Gokyo lake. Sherpa capital called Namche Bazar. Where is Heaven? People are wondering in their dreamland about what a heaven looks like. Backpacker would like to proudly introduce you to the heaven in earth. The trail crossing the swift white water rapids via swinging bridge, encountering the Yaks and Sherpas, backpacker team of trekkers would lead you to the lake dancing besides Everest up there in mountain. Hellen Keller once said that “Life is either a daring adventure or nothing.” Absolutely embrace the adventure in life as it brings color into the dull affairs of your life. The mind and body would revitalize with the magical setting of the Gokyo lake and its periphery. The journey starts from the airplane carrying you to the most adventurous airport on earth, The Lukla giving you the chance to get encounter with the boundless Himalayan ranges view and hilly terrain of Nepal from plane. The joyous landing in Lukla would remind you of the great rocky terrain of Nepal. Though Lukla airport is regarded as the most dangerous airport of the world, the fun and safety is guaranteed for our guests. The fear of unknown could be vanished with the view of majestic Mother Nature on the way to Lukla. The actual walking trail starts from Lukla which is also the gateway to the superlative mountain called Mount Everest. The first day of trek would of honeymoon for the trekkers as we have designed to acclimatize all the trekkers as quickly as possible. The continuous downhill trek to Phakding let you relish the jaw dropping scenery and the alpine forest. The Phakding offers you the good day rest with the amazing hospitality of the local hotel operated by Backpacker itself. As is our motto that the trekkers should be given chance to experience the authentic taste of the host place, we have operated ourselves an accommodation for your comfort. The next stop for all the Trekkers would be the Everest View Hotel which is the hotel located in the highest altitude in the world. The view that you get from there would let you forget all the pain, hardwork and struggle that you do in your everyday chores. The lens of camera will not get any rest as the beauty around you continues to hypnotize. The major highlight of this trekking in Nepal is the visit of Sherpa capital called Namche Bazar. This small Sherpa town surprises you with most of the modern amenities like internet, food and shop and also let you embrace the Sherpa community. The trip from Namche to Gokyo passing Dole and Machhermo ignites your creativity. The Shakespeare within you would reincarnate and your imagination starts to flourish like poetry of a poet. The five lakes up in 4790 mtrs high let you leave behind all the hardship that you did while trekking. Experience the astounding adventure of the glacial down power and cool thin air breeze. The night seems more attractive with the stars just close to you as it is in your own ceiling. Come; experience the adventure in your life with the Backpacker team. The fun begins with us and the memory of your trek remains darted in your heart. Day 01Arrival Kathmandu & transfer to hotelArrival Kathmandu & transfer to hotel.Upon arrival at Kathmandu, Backpacker Expedition Treks Pvt. Ltd will be your trustworthy travel companion until you depart for your home country. We will accommodate our valued customers in the three-star hotel in Kathmandu. We take care of the room and breakfast of our valued customers during their stay in Kathmandu Valley. Day 02Fly Kathmandu to Lukla & trek to Phakding Early morning Fly to Lukla(2810m.)30min. The Lukla airport often called as Tenzing Hillary Airport is the world’s most dangerous airport. The thrill of landing in such an airport is an added experience to make. From Lukla the Trek begin to Phakding. Phakding is a small village in the Khumbu region of Nepal. It lies in the Dudh Kosi river valley just north of Lukla and south of Monjo, at an altitude of 2,610 m. In this part of the trek we reach to Jorsalle which is the entry point of the Sagarmatha National Park where entry permit will be checked. Day 03Trek to Namche (3445m) Namche is a village and Village Development Committee (Namche) in Solukhumbu District in the Sagarmatha Zone of north-eastern Nepal. It is located within the Khumbu area at 3,440 metres (11,286 ft) at its low point, populating the sides of a hill. Namche is the main trading center and tourist hub for the Khumbu region with many Nepalese officials, a police check, post and a bank. It is also the place for acclimatizing for the trekkers to go further towards base camp. Day 04Acclimatization day in Namche Bazaar. The acclimatization process takes place in Namchebazar by taking short day hiking or relaxing by roaming around in the Namche itself. According to health experts, the trekkers should always move while relaxing and acclimatizing to the altitude. So, we take our fellow trekkers to either short hiking or walking in and around Namche before setting up for the further trek. Trekkers can hike to the world’s highest placed hotel “The Everest View hotel” from where you can see the spectacular view of the Mount Everest, Ama Dablam, Thamserku, Khangtega and other panoramic views of snow capped mountains.The Khangtega mountain is unique to its geographical setting as it resembles the back pack of Horse riding. Day 05Trek to Dole (4200m)The trail is easy in the begging as we cross valleys along the rhododendron, juniper and large coniferous forests. During spring the forests are great to see as that is the time when rhododendrons bloom and the fragrance lingers on your nose for many days. We also see Sherpas bringing their herds of Yaks for grazing on the green pastures. Overnight stay at a guesthouse. Day 06Trek to Machhermo (4400m)The trail now becomes gradually difficult as the trekkers will have to negotiate thick forests, the increasing altitude and the lack of settlement areas. The trails continue to climb up along the side of the valley until it reaches Machhermo. It is also believed that the region of Machhermo is the home of Yeti, mythical snowman. It is believed that Yeti lives on snow and somewhere around the region of Everest. Overnight stay at a guesthouse. Day 07Trek to Gokyo (4790m) 4 hrs On the seventh day, we climb just around 300 meters and reach Gokyo Valley. We come across several glacier lakes on our way before reaching the amazing Gokyo Valley. Gokyo is a sparsely populated settlement area in the Khumbu region, predominantly inhabited by the Sherpas. 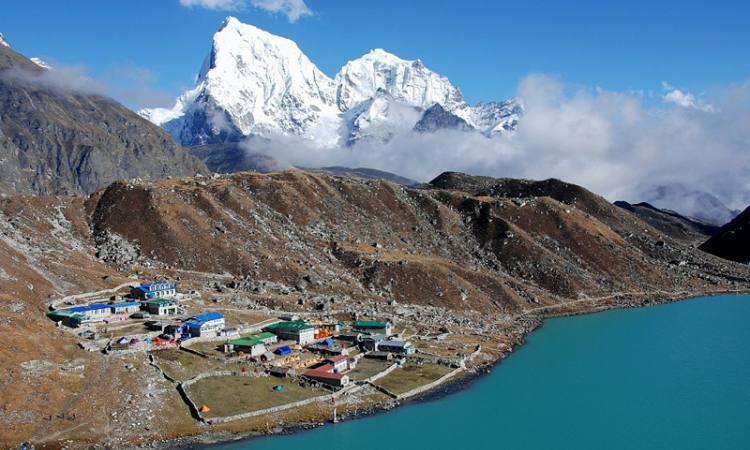 Gokyo mountain peak and Gokyo Lake are other attractions of Gokyo region. Overnight stay at a guesthouse. Day 08Acclimatization day in Hike to Gokyo-RiEarly Morning hike up to the Gokyo-Ri, for spectacular scenery of Everest Himalayan range, it takes about 2:3 0hrs hike to the top, showing a beautiful view of Cho-Oyu, Gyachung Kang, Everest, Lhotse, Makalu, Cholatse and Tawache & a great looking of Ngozumpa glacier the biggest glacier in Khumbu. Day 09Trek Back to DoleThe Gokyo -Ri gives you the lifetime opportunity to witness kissing of morning sun rays at the tip of several mountains including the Mt. Everest. All our tiredness and the hardship would vanish with the majestic scenery that you can see from here. You will feel as if the heaven and earth are actually connected right here. These moments are the most precious part of this trekking. Once you get back to your normal setting the memory of these panoramic views would always motivate you. Day 10Trek to Namche Bazar From Dole we reach to Mongla, a steep descent of about 1500ft/500m leads through rhododendron forests and fir trees to the Dudh Koshi River.before finally reaching beautiful village of Namche. Upon arrival at this juncture, we can have the gorgeous Ama-dablam, Thamserku, Nuptse, Lhotse and Everest once again. Day 11Trek to Lukla. The last day of trekking. At this juncture we will have fun while trekking with some songs on popular nepali folk tunes, we will share the pictures that we took and the memories that we cherished. Upon reaching Lukla we will give rest to our mind and body. Day 12Fly back Lukla to Kathmandu We head back to Kathmandu and as earlier the accommodation will be provided along with the breakfast in a three-star hotel in Kathmandu. On a spare day, you can roam around Thamel or other major touristic areas at Kathmandu and do some shopping and dinner at Nepali typical Resturant with cultural program. Day 13Departure to final Destination (Farewell) We always feel very sad at this very juncture that our companion of trekking for the moment ends here and in the meantime we also feel relaxed that we were able to serve you with the best trekking experience that you ever get in your lifetime while trekking. We would leave no stone unturned to make your customers feel important and happy. We always take suggestions and encourage our valued customers to promote Nepal and Trekking in Nepal.